Posted on 4, March 2016 by EuropaWire PR Editors | This entry was posted in Automotive, Business, Germany, Management, Transportation & Logistics and tagged Daimler, Daimler South East Asia Pte Ltd, Dr. Wolfgang Bernhard. Bookmark the permalink. Stuttgart/Singapore, 04-Mar-2016 — /EuropaWire/ — Daimler is continuing to speed ahead with the regionalisation of its sales and service organisation for the commercial vehicle business in important growth regions. Today the new regional center for commercial vehicles started business in South East Asia. Responsible for 18 markets, the new Daimler South East Asia Pte Ltd regional center (DSEA) based in Singapore oversees sales and service activities covering both Mercedes-Benz trucks, buses and vans and FUSO trucks and buses – from the urban light duty Mercedes-Benz Citan transporter to the heavy-duty FUSO Super Great. “In South East Asia we sold more than 40,000 commercial vehicles in the past year. That illustrates how important this region is for us already”, stated Dr Wolfgang Bernhard, Member of the Board of Management of Daimler AG, with responsibility for Daimler Trucks & Buses. “And that importance will increase within the coming years: In the emerging countries of South East Asia the demand for trucks, buses and vans will rise continuously – and we are determined to participate considerably in this growth. That is the clear objective of our new regional center. As the innovation leader and logistic hub of this region, Singepore is the perfect spot for it”, added Dr. Bernhard. At the Singapore location, Daimler’s new center for South East Asia benefits from the dynamic business climate, a potential of highly qualified workforce and the excellent infrastructure of the island state. With one of the best airports in the region and as the second largest container port in the world, Singapore is the central transport and logistics hub for the region. Mercedes-Benz has been active in Singapore since the 1950s. Singapore is also an important market for Daimler’s bus and coach business. Illustrating this, at the opening of the regional centre for South East Asia, attended by general distributors, customers and the press, the 1000th Mercedes-Benz Citaro urban bus has been handed over to the long running customer SBS Transit in Singapore. SBS Transit operates approximately 3.000 buses on over 250 bus routes, representing 75 percent of the public transport in the city with more than 5 million inhabitants. The island state is home to the biggest single fleet of Mercedes-Benz Citaro urban buses in operation worldwide. All vehicles come from the EvoBus plant in Mannheim, Germany. Mercedes-Benz buses have been travelling Singapore’s roads for over 15 years now. 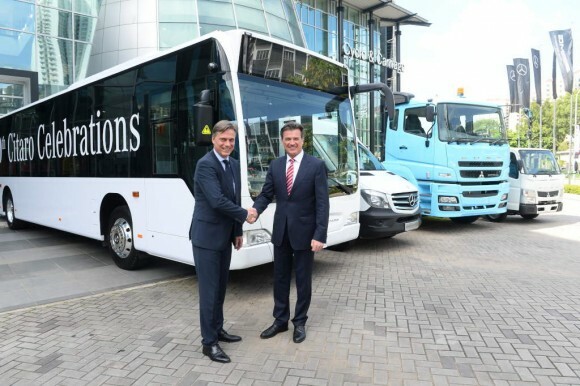 “Delivering the 1000th Mercedes-Benz Citaro bus to Singapore today is an impressive proof for the potential of our partnership with the city state. Singapore is shaping the city of tomorrow – Daimler is shaping the mobility of tomorrow. Together we’ll define standards with highly innovative transport systems worldwide”, said Dr. Bernhard. With around 45,000 units the Citaro is the most built Mercedes-Benz bus ever. Around 60 percent are built for export, the Citaro is operating in more than 40 countries, transporting millions of passengers. The Citaro is the undisputed segment market leader in Germany and Europe. The business of Daimler’s commercial vehicle devisions in the South East Asia region covers 18 markets, including Indonesia, Thailand, Malaysia, Singapur, the Philippines and Vietnam. With 622 million inhabitants, the region is more populous than the USA (> 300 million) or Europe (> 500 million) and, with over 50 percent of the population under the age of 30, it offers dynamic prospects for the long-term future. In 2015 ten South East Asian countries (Indonesia, Thailand, Malaysia, Vietnam, Singapore, the Philippines, Myanmar, Laos, Brunei and Cambodia) formed the ASEAN Economic Community in order to strengthen cross-border trade. Foreign direct investments (FDIs) in the ASEAN area rose from USD 85 billion in 2007 to USD 136 billion in 2014. Emerging economies with growing transport needs offer market opportunities both for Mercedes-Benz and FUSO Commercial Vehicles – in 2015 the truck market in Vietnam, for example, grew by 92 percent, and the truck market in the Philippines grew by 27 percent. The overall market volume in South East Asia totalled around 225,000 vehicles (2015). Daimler sold more than 40,000 commercial vehicles in the South East Asia region in 2015. Daimler operates six CKD assemblies for commercial vehicles in the South East Asean region: one in Indonesia, in Malaysia, in Thailand, in Vietnam and two facilities in Taiwan. In Malaysia Mercedes-Benz trucks already assembled its 25.000th truck in 2015. The regional center in Singapore covers 18 markets: Brunei, Cambodia, Fiji, French Polynesia, Hong Kong, Indonesia, Laos, Malaysia, Mongolia, New Caledonia, Papua New Guinea, Philippines, Singapore, South Korea, Taiwan, Thailand, Vanuatu, Vietnam. With the foundation of the six regional centres, Daimler is focusing even more strongly on regional customer demands in the commercial vehicle sector – and doing so locally. Since October 2015 Daimler has managed its commercial vehicle activities in the Middle East & North Africa region (MENA) from a regional sales centre in Dubai. In February 2016 the two regional centres for Africa (East, Central and West Africa) and the Southern Africa region (South Africa, Namibia, Zimbabwe, Mozambique, Botswana, Malawi, Zambia, Lesotho and Swaziland) opened their offices. The two centres are together responsible for 50 markets on the African continent. Until now Daimler has primarily overseen these regions from the Group headquarters in Stuttgart. Further regionalisation is helping Daimler Commercial Vehicles to bring the business even closer to the pulse of the market. Years of product and service expertise pay dividends here, as does the broad product range of the Group’s different commercial vehicle brands.